All major towns in the Northern Rivers of New South Wales and Gold Coast hinterland of South East Queensland region offer extensive retail and shopping facilities, located in central business districts. Listed here are local suburban shopping centres for daily groceries and household items, and general stores in the seaside villages, hinterland and backcountry areas for those last minute shopping items. Many of the general stores also offer Postal services, and often sell local arts and crafts. 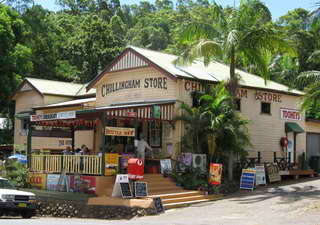 In smaller communities and the seaside villages, hinterland and backcountry areas, general stores stock grocery and household items, sometimes local arts, crafts and souvenirs, and are usually the local Australia Post office. Petrol may also be available. Everything you need in a handy one stop location. A dynamic cluster of retail outlets including national chains, providing quality, fresh produce and grocery, clothing, pharmaceuticals, cosmetics; optometry, hairdressing, fine jewellery, health and banking.